Col. David L Hrdlicka (USAF) was shot down in Sam Neua Laos May 18, 1965. A photograph was taken of his capture. He was reported alive in the hands of the Pathet Lao. See "Leads/Clues" that related to Col. Hrdlicka here and here. He was not returned home with other American POWs in 1973. 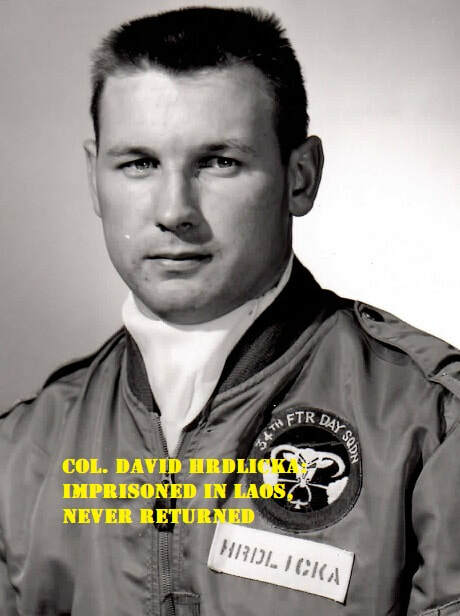 Col. David L Hrdlicka (USAF) ຖືກຍິງໃນເຂດຊຳເໜືອຂອງລາດ ໃນວັນທີ່ 18 ເດືອນພຶດສະພາ ປີ 1965. ໃນຂະນະເຂົາຖືກຈັບກຸມ ໄດ້ມີການຖ່າຍຮູບໄວ້. ມີລາຍງານວ່າເຂົວຍັງມີຊີວິດຍູ່ ແລະ ຍູ່ໃນການຄວບຄຸມຂອງປະເທດລາວ. ເຂົາບໍ່ໄດ້ຖືກສົ່ງຕົວກັບບ້ານພ້ອມກັບນັກໂທດຊາວອາເມລິກັນຄົນອື່ນໆໃນປີ 1973. “As the wife of Col. David L. Hrdlicka, I would appreciate any information that can be given on the welfare and whereabouts of my husband. I only seek information on my husband and hold no ill will towards anyone; the war is long over so it is time for healing. My grandkids never had the opportunity to meet their grandfather and David never had the joy of seeing his grandchildren grow. I would be most grateful for any information as to David's whereabouts or how to get in touch with anyone who has information on David:” Carol Hrdlicka (wife).